Ιδανικό για χαλάρωση και διασκέδαση, το Boracay Backpackers βρίσκεται στην περιοχή Στέισιον 1 της πόλης Νησί Μπορακαϋ. Σε απόσταση μόλις 1.1 km από το κέντρο της πόλης και 8.4 km από το αεροδρόμιο, αυτό το 3 αστέρων ξενοδοχείο προσελκύει αρκετούς ταξιδιώτες κάθε χρόνο. Με την βολική του τοποθεσία, το ξενοδοχείο προσφέρει εύκολη πρόσβαση στους προορισμούς της πόλης που πρέπει οπωσδήποτε να δείτε. Με τις υψηλού επιπέδου υπηρεσίες και την μεγάλη ποικιλία ανέσεων, το Boracay Backpackers δεσμεύεται ότι η διαμονή σας θα είναι όσο πιο άνετη γίνεται. Τα δωρεάν WiFi σε όλα τα δωμάτια, 24ωρη φύλαξη, ημερήσιος καθαρισμός, ιδιωτικό τσεκ ιν/τσεκ άουτ, υπηρεσία ταξί είναι μόνο λίγες από τις εγκαταστάσεις που κάνουν το Boracay Backpackers να ξεχωρίζει από τα άλλα ξενοδοχεία στην πόλη. Τα δωμάτια του ξενοδοχείου έχουν διαμορφωθεί προσεκτικά ώστε να παρέχουν υψηλό επίπεδο άνεσης και την ευκολίας. Σε κάποια από τα δωμάτια, οι επισκέπτες μπορούν να βρουν επίπεδη τηλεόραση, λευκά είδη, θυρίδα, πετσέτες, σύνδεση internet (ασύρματη). Κατά τη διάρκεια της μέρας μπορείτε να απολαύσετε την χαλαρωτική ατμόσφαιρα των κήπος. Όταν ψάχνετε για ένα άνετο και βολικό μέρος για να μείνετε στη Νησί Μπορακαϋ,το Boracay Backpackers γίνεται το σπίτι σας μακριά από το σπίτι σας. I stayed for three nights and had a great time. It’s nothing fancy but perfect for a couple days if your on a budget. The staff was really friendly. The location is in an alleyway but literally a two minute walk to the beach. The room is clean and the staff are friendly and nice. .Our whole boracay trip was perfect beacuse we stayed at the perpect room. Thank you Boracay Backpackers. They even allow us to left our things after check out so we could stay until the evening. Clean room and spacious but air condition did not work well. I had a hard time finding the place and it is not well known. First I had to look for an e-tryke driver who has heard of the place then when I was dripped off Station 1 I had to ask a few locals to know exactly where it is. Finally I found it after asking a small souvenir shop lady. The place is good. Clean enough. Great value for money, cleaned our room everyday. The only thing we had ants in our room and they took care of it immodestly and proposed another room. Towels are not the best quality, so would recommend to bring your own. I stayed on their bunk bed for 4 room, for 3 nights and 4 days. Upon arrival, hotel is kinda difficult to find as they don't have much signs on the street but for upcoming guests, there's an alley in front of Jonah's Fruit Shake and Snack Bar in station 1, once you see Palawan Express Padala you can go straight and then left. Some call it Beach Access. They don't give towel and free water for their guests so you should bring one, and they don't want your slippers inside the room so you need to leave it outside, it's better to bring room slippers. For their staffs, they're approachable and willing to help. Ambiance in the hotel is cozy and they have lockers for your bag. Suggesting to make a small window so that there's some air coming from the outside. value for money - I booked the single bed in a room for 4 people. Good service! value for money. friendly staff, good times. WE BOOKED A DELUXE STANDARD TOOM. THE ROOM IS SO BASIC....PLAIN WHITE PAINT, NO WATER KETTLE, NO CABLE TV (THEY'RE ONLY USING TV PLUS), NO GLASSES PROVIDED INSIDE THE ROOM (YOU HAVE TO ASK AND GET IT FROM THE KITCHEN OUTSIDE). First time to try backpacking and it was awesome! I felt at home and everyone (guests) was so relaxed... the boracay vibe is in the air and the staff !!!! They are so nice!!! A bigger locker or easier access to lockers would be a great addition. Please expand so you can cater to more !!! Kudos!!! Great location. Really nice garden. But that’s about it, not very good value for money, staff very unhelpful. Doesn’t offer any water refill (well they do but only for staff even if you offer to pay for it they won’t let you!) for an island that was recently shut down due to needing a massive clean up they should really be doing more to reduce plastic and waste. Disappointing. The place was okay but during our entire 3 days and 2 nights of stay there was a power outage. On our 1st day, the power went out at 3 pm and then went back on so late... it was almost 11 PM. on our 2nd and 3rd day.. the power also went out from 8 am and went back on at 5-6pm. They dont have a generator... not even emergency lights putside their room. on our 1st night I ask for an emergency light and they gave me candles instead. On our 2nd day, they gave us a portable emergency light. When I ask why dont the have a generator, their answer was because they were not able to secure a permit... It make me puzzled. why would it require a permit?!? It’s so unreasonable to think that it supposed to be required since thr power facilities in the are is not stable. They didnt give us ang discount, or any complimentary drinks/food... they did not even apologize. Poor ethics and customer service. So if ur thinking of booking this Inn, better look for other options. Dont waste your money bu staying on this Inn. I will NEVER recommend this despite thr excellent reviews. the reviews were quite decieving. The place was good BUT during our stay it was Brownout. Literaly they don’t have a generator. On our first day the power went out at 3 pm and the power went back at 1030 Pm. they don’t even have an emergency light. they just gave us candles.... on iur 2nd day the power again went off at 8 am and it returned at 5 pm. same thing kn our last day... My Bf was not feeling well but he had no choice but tonstay in our room. the manager did not even apologize. No discount was given. when we asked why there was no generator they said that they didnt have a permit to have one.... its so very unreasonable. they dont have a contigency plan at all. so if ur thinking about this place... I WILL NEVER RECOMMEND this. Its so horrible. Thank you for staying with us. We are doing our best to improve more for our guests satisfaction. This was the first hostel I stayed at, and the pictures look way better than it is. The place is hard to find, and you need to walk through dirty alleyways to find it. I stayed in a room with bunkbeds, and the first bed they gave me had stuff in the safe so they moved me. The bathroom was not great, and I felt uncomfortable and wasn't sure how clean it was. Also the shower wasn't separate from the toilet (not even a shower curtain), so not sure how people didn't get water everywhere when they showered. Thankfully I had a hotel booked the next day with my own room. At least the wifi worked. 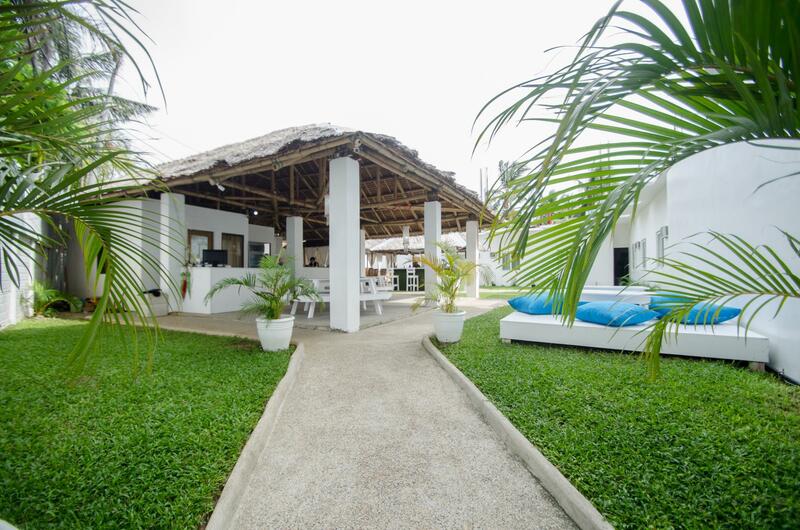 Near the beach, short walk to dmall, short distance to willys rock, quiet and relaxing, polite staff. 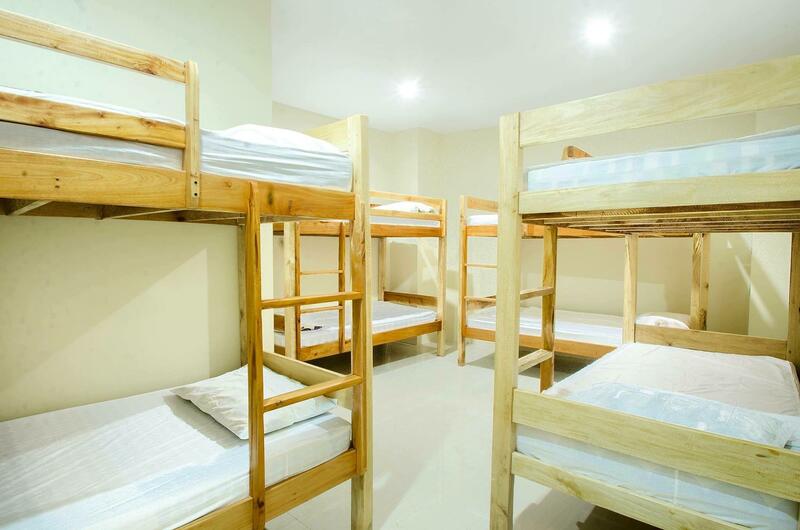 Good water pressure and heat, okay air conditioning, pretty good place if youre on a budget, they have a roofdeck where you can hang wet clothes swimsuits, just bring your own clothespins, just a really chill place, you can book swimming activities with them and their affiliates.